An original modern abstract by American artist James Koenig. 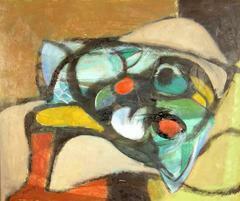 This work created in 1954 is featured in the Draw Near exhibition currently on view at Benjaman Gallery. Vintage American modernist abstract painting. Oil on canvas, circa 1980. Unsigned. Displayed in a silver wood frame. Image, 18"L x 24"H, overall 22"L x 28"H.
An intriguing and complex composition composed of guns, rifles, ammo and a bullseye. Work is housed in a rustic Heydenryk frame. Nina - 1969 Watercolour in a wooden frame under glass Keywords: abstract, vase, table, tablecloth, still life, fruit, apple, watercolor, red, animal, eggs, blue, flowers. Mid century modern art with inscription in french verso. It was traded with another artist.